Inside: Eleven frugal Father’s Day gift ideas for you and your kids. Dads work hard, whether at home or at work. And we know that good Dads are priceless. But that doesn’t mean you need to spend a lot of money to let him know how you feel. If you need ideas for the Dad in your life or ideas for gifts from the kids, then this list of frugal Father’s Day gifts should help. If there is more than one child in the family, Dad may not get much one-on-one time with the kids. Arrange for Dad to have special time with each child, even if it is spread out over a few weeks. Go to an event or game, grab an ice-cream sundae, or go for a drive. Give Dad a break and do some yard work. Mow the lawn, pull some weeds and water the plants so he has a break from those chores. While you are out there, you could even clean the grill for him. Garages tend to become a dumping ground for everything and often tools and other items never get put back in quite the right place. Spend a day or two and sweep out, declutter, and straighten up the garage. Give Dad’s car a thorough wash and wax. And don’t forget to vacuum inside. He’ll appreciate the effort and enjoy the fruits of your labor. Father’s Day is in mid-June. With any luck, the sun will be out so you can enjoy an afternoon at the park. Try packing a picnic and go play, hike, or maybe even put together a game of kickball. Little ones really don’t need to get Dad a gift, but usually want to. Have them paint or draw a special picture for Dad. He’ll love it. Other gifts kids can make include paperweights (paint a rock), bookmarks, or write a short story about Dad. Do breakfasts at your house normally consist of toast or cereal? Whip up something special for Dad. Ideas for foods he may love could include a breakfast casserole, biscuits and gravy, an omelet, or waffles. The kids can help cook, too! If you have time in advance, put together a photo book for Dad with pictures of the family. You can even get a mug with a favorite picture of the kids printed on it. Does your Dad like to fish? Arrange a morning of fishing with him. Pack a few of his favorite snacks to bring along. Ask Dad about his favorite movies. Maybe he likes old spaghetti westerns, action films with a bit of humor, or a good comedy. Buy a few of them along with some microwave popcorn. He can watch the movies over and over again. If Dad likes to play ball or a round of golf, take him out for a game. You can also find a local game or race to watch for the day. Local high school games can be inexpensive and exciting to watch. If Dad is more of a board gamer, spend the day playing some of his favorite games with him. Showing Dad you care needn’t mean spending a lot of money. 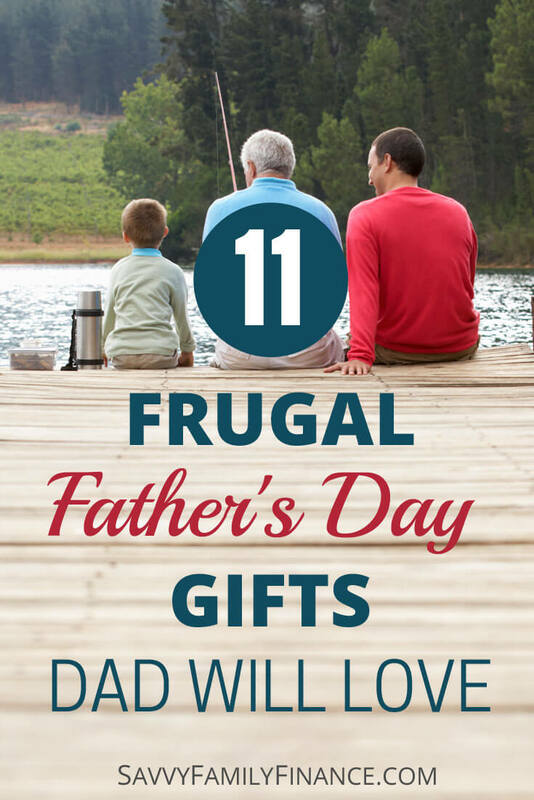 He will likely appreciate the money lessons you have learned by giving him a memorable, yet frugal Father’s Day. In fact, remembering the day and spending quality time with him is often enough. What do you like to give Dad on his special day? Great gift ideas. As a dad with 3 little ones, the best gifts they give me are the handmade cards and pictures they make themselves. I save them all and they always bring a smile to my face. I do like the idea of one-on-one time with each kid. With busy schedules that can be tough to do. Most of our one-on-one time is driving in the car on the way to soccer or softball practice, but I do make the most of it and we usually have some silly laughs along the way. It is nice to have alone time with each child. They end up telling you so much! The older I get (I’m in my 40s), the more I value experiences with people. Assuming I dodge old-age dementia, those gifts last a lifetime in your head. Life is short and physical things pass through the exciting period pretty quick.